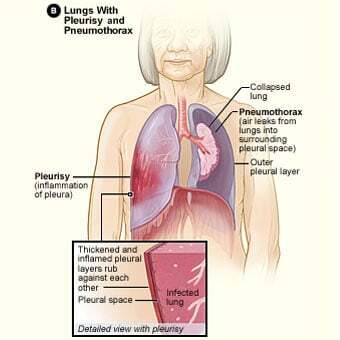 Pleurisy involves inflammation of the tissue layers (pleura) lining the lungs and inner chest wall. 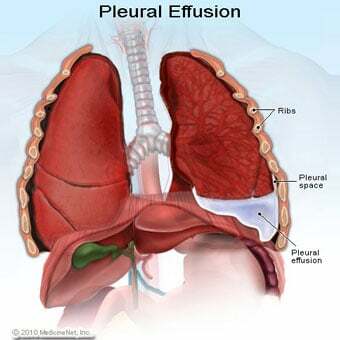 Pleurisy is often associated with the accumulation of fluid between the two layers of pleura, known as pleural effusion. Symptoms of pleurisy include pain in the chest, which is aggravated by breathing in, shortness of breath, and local tenderness. This pain can effect the chest cavity in either the front or back of the cavity, and sometimes patient's have back or shoulder pain. 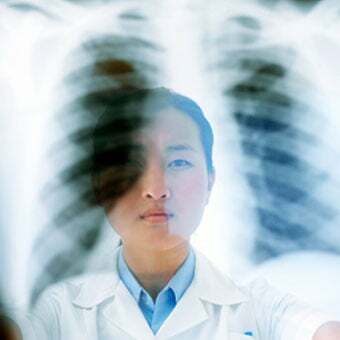 The diagnosis of pleurisy is made by the characteristic chest pain and physical findings on examination of the chest. The sometimes-associated pleural accumulation of fluid (pleural effusion) can be seen by imaging studies (chest X-ray, ultrasound, or CT). Analysis of pleural fluid aspirated from the chest can help determine the cause of the pleurisy. Treatment of the underlying conditions is key to the proper management of pleurisy. Pleurisy describes the chest pain syndrome characterized by a sharp chest cavity pain that worsens with breathing. 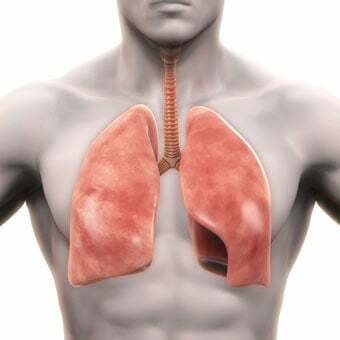 Pleurisy is caused by inflammation of the linings around the lungs (the pleura), a condition also known as pleuritis. There are two layers of pleura: one covering the lung (termed the visceral pleura) and the other covering the inner wall of the chest (the parietal pleura). These two layers are lubricated by pleural fluid. Pleurisy is frequently associated with the accumulation of extra fluid in the space between the two layers of pleura. This fluid is referred to as a pleural effusion. The pain fibers of the lung are located in the pleura. When this tissue becomes inflamed, it results in a sharp pain in the chest that is worse with breathing. 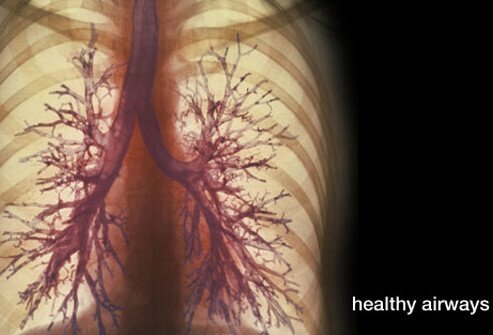 Other symptoms of pleurisy can include cough, chest tenderness, and shortness of breath. The pleura is composed of two layers of thin lining tissue. The layer covering the lung (visceral pleura) and the parietal pleura that covers the inner wall of the chest are lubricated by pleural fluid. Normally, there is about 10-20 ml of clear liquid that acts as a lubricant between these layers. The fluid is continually absorbed and replaced, mainly through the outer lining of the pleura. Pressure inside the pleura is negative (as in sucking) and becomes even more negative during inspiration (breathing in). The pressure becomes less negative during exhalation (breathing out). Therefore, the space between the two layers of pleura always has a negative pressure. The introduction of air (positive pressure) into the space (such as from a knife wound) will result in a collapse of the lung. The most common symptom of pleurisy is pain that is generally aggravated by inspiration (breathing in). Although the lungs themselves do not contain any pain nerves, the pleura contains abundant nerve endings. When extra fluid accumulates in the space between the layers of pleura, the pain usually is a less severe form of pleurisy. With very large amounts of fluid accumulation, the expansion of the lungs can be limited, and shortness of breath can worsen. 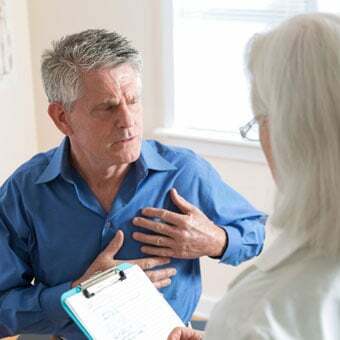 To make the diagnosis of pleurisy, a doctor examines the chest in the area of pain and can often hear (with a stethoscope) the friction that is generated by the rubbing of the two inflamed layers of pleura with each breath. The noise generated by this sound is termed a pleural friction rub. (In contrast, the friction of the rubbing that is heard with pericarditis occurs synchronous with the heartbeat and does not vary with respiration.) With large amounts of pleural fluid accumulation, there can be decreased breath sounds (less audible respiratory sounds heard through a stethoscope) and the chest is dull sounding when the doctor drums on it (termed dullness upon percussion). A chest X-ray taken in the upright position and while lying on the side is a tool in diagnosing fluid in the pleural space. It is possible to estimate the amount of fluid collection by findings on the X-ray. Occasionally, as much as 4-5 liters of fluid can accumulate inside the pleural space. Ultrasound is a method of detecting the presence of pleural fluid. A CT scan can be very helpful in detecting very small amounts of fluid and trapped pockets of pleural fluid, as well as in determining the nature of the tissues surrounding the area. Removal of pleural fluid with a needle and syringe (aspiration) is essential in diagnosing the cause of pleurisy. The fluid's color, consistency, and clarity are analyzed in the laboratory. The fluid analysis is defined as either an "exudate" (high in protein, low in sugar, high in LDH enzyme, and high white cell count; characteristic of an inflammatory process) or a "transudate" (containing normal levels of these body chemicals). Causes of exudative fluid include infections (such as pneumonia), cancer, tuberculosis, and collagen diseases (such as rheumatoid arthritis and lupus). Causes of transudative fluid are congestive heart failure and liver and kidney diseases. Pulmonary emboli can cause either transudates or exudates in the pleural space. The fluid can also be tested for the presence of infectious organisms and cancer cells. In some cases, a small piece of pleura may be removed for microscopic study (biopsied) if there is suspicion of tuberculosis (TB) or cancer. External splinting of the chest wall and pain medication can reduce the pain of pleurisy. Treatment of the underlying disease, of course, ultimately relieves the pleurisy. For example, if a heart, lung, or kidney condition is present, it is treated. 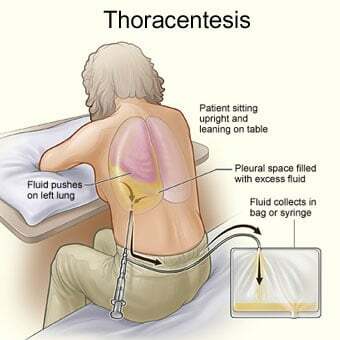 Removal of fluid from the chest cavity (thoracentesis) can relieve the pain and shortness of breath. Sometimes fluid removal can make the pleurisy temporarily worse because without the lubrication of the fluid, the two inflamed pleural surfaces can rub directly on each other with each breath. If the pleural fluid shows signs of infection, appropriate treatment involves antibiotics and drainage of the fluid. 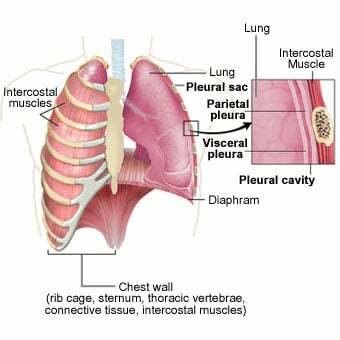 If there is pus inside the pleural space, a chest drainage tube should be inserted. This procedure involves placing a tube inside the chest under local anesthesia. The tube is then connected to a sealed chamber that is connected to a suction device in order to create a negative pressure environment. In severe cases, in which there are large amounts of pus and scar tissue (adhesions), there is a need for "decortication." This procedure involves examining the pleural space under general anesthesia with a special scope (thoracoscope). Through this pipelike instrument, the scar tissue, pus, and debris can be removed. Sometimes, an open surgical procedure (thoracotomy) is required for more complicated cases. In cases of pleural effusion that result from cancer, the fluid often reaccumulates. In this setting, a procedure called pleurodesis is used. This procedure entails instilling an irritant, such as bleomycin, tetracycline, or talc powder, inside the space between the pleural layers in order to create inflammation. This inflammation, in turn, will adhere or tack the two layers of pleura together as scarring develops. This procedure thereby obliterates the space between the pleura and prevents the reaccumulation of fluid. Some cases of pleurisy can be prevented, depending on the cause. For example, early intervention in treating pneumonia may prevent the accumulation of pleural fluid. In the case of heart, lung, or kidney disease, management of the underlying disease can help prevent the fluid collection. How was the diagnosis of your pleurisy (pleuritis) established? How was your pleurisy treated? What symptoms did you experience with your pleurisy? 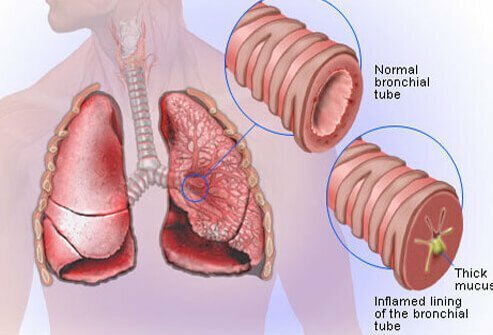 What was the underlying condition that caused your pleurisy?